Beautiful apartment of 90 square meters, located in a great location, in a residential area, but close to all the tourist attractions and landscapes of Rome. It is only a 7-minute walk from St. Peter's Basilica and a 15-minute walk from metro A, while, right in front of the building that houses our structure, we find the SAN PIETRO train station, the taxi station and the end of bus 64, which through the Old Town (Castel Sant'Angelo, Piazza Navona, Pantheon, Campo De 'Fiori, Piazza Venezia, Fori Imperiali) leads to TERMINI station. Near the district we find the splendid Villa Pamphili (one of the many parks in Rome) and the Gianicolo, from which you can enjoy a breathtaking view of the city. On foot with a pleasant walk you can get to the heart of the city: Castel Sant'Angelo, Trastevere, Piazza Navona, Campo De 'Fiori. The apartment, equipped with free WI-FI, is very quiet and can accommodate up to 6 adults plus one child. a large open-plan lounge with fully equipped kitchen (gas hob, electric oven and microwave, electric kettle, toaster, french press, moka coffee maker, crockery and fridge). In the lounge there is also a dining table for 6 people. a large bathroom with large shower, double sinks, toilet, bidet and washing machine. the very large Blue room ideal for adding a cot / crib. All rooms are equipped with bed linen and towels with weekly change, and are equipped with air conditioning / heating and TV. The blue room also has a DVD player. In the neighborhood there are several restaurants, pizzerias and pubs and a few meters you can find a supermarket open 24 hours! Possibility of parking in the garage at a discounted rate. From Fiumicino Airport: train line FL1 to Trastevere Station, then FL3 dir. Viterbo (one stop) or FL5 dir. Civitavecchia (two stops) to San Pietro Station. Or take the first train available for TERMINI station. Or from TERMINI station take bus n. 64 to the end of the line. 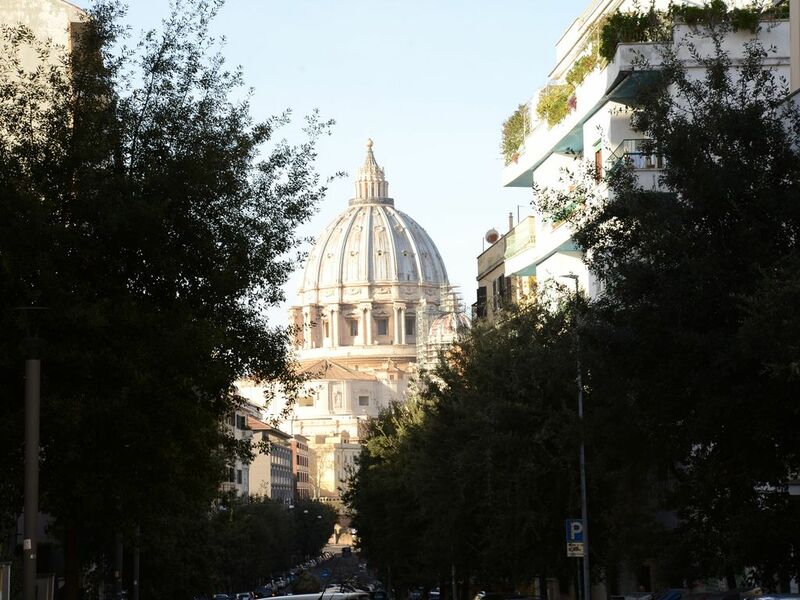 Our house is located a few hundred meters from St. Peter's Basilica, in a very quiet part of the neighborhood. Right next to us there is a supermarket open 24 hours and a few meters away, on the main street, via delle Fornaci, we find several restaurants and pizzerias for all tastes. For theater lovers, always on Via delle Fornaci, there is the famous Teatro Ghione.